Kaye Communications, Inc. invites the community to the third annual “White Coats-4-Care” awareness and fund raising reception to benefit Florida Atlantic University’s Charles E. Schmidt College of Medicine on Thursday, August 1, 2013 from 5:30-7:30 p.m. at JAZZIZ Nightlife at Mizner Park, 201 Plaza Real, Boca Raton. 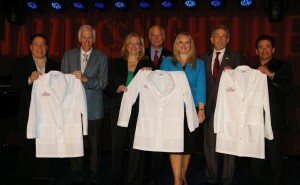 The theme of the event – to “dress and equip” the college’s incoming class for success – is presented to heighten awareness of the first and only medical school in Palm Beach County, to embrace Florida’s future physicians with a warm community welcome, and raise vital funds to equip these students with the tools they need to begin their medical education and launch their careers. FAU’s Charles E. Schmidt College of Medicine officially welcomes its third incoming class of 64 students on August 5, 2013. During a special ceremony on August 9th, each medical student will receive a white coat that represents integrity, compassion and trust and symbolizes their shared commitment to serve patients and honor the Hippocratic Oath. The incoming class of FAU’s Charles E. Schmidt College of Medicine has a cumulative GPA of 3.6 and an average MCAT score of 31. Most of the major colleges in Florida are represented. Other students in the class attended undergraduate institutions such as Arizona State, Brown, Cornell, Case Western Reserve, Emory, Furman, Georgia Southern, Maryville, Princeton, Rice, State University of New York, University of Massachusetts, University of Michigan, University of Alabama, U.S. Air Force Academy and Tufts. To be attended by a cross-section of healthcare, business, community and civic leaders, White Coats-4-Care is the first event scheduled in the Greater Boca Raton Chamber of Commerce’s month-long “Festival Days,” now in its 22nd year. The series pairs non-profit and for-profit chamber members to raise awareness and vital funds for non-profits. Pairing Kaye Communications, a South Florida-based strategic integrated marketing and public relations firm, with FAU’s medical school continues to be a natural fit. Firm Chief Operating Officer Jon Kaye serves on the Dean’s Medical Advisory Board for the Charles E. Schmidt College of Medicine and President Bonnie Kaye serves on the board of directors for both the Chamber and FAU Foundation. For more information about “White Coats-4-Care”, pledge your gift to attend the event, or make a contribution, contact Kari Oeltjen, Director of Development, FAU Charles E. Schmidt College of Medicine, at koeltjen@fau.edu or 561-699-7198.